The U.S. 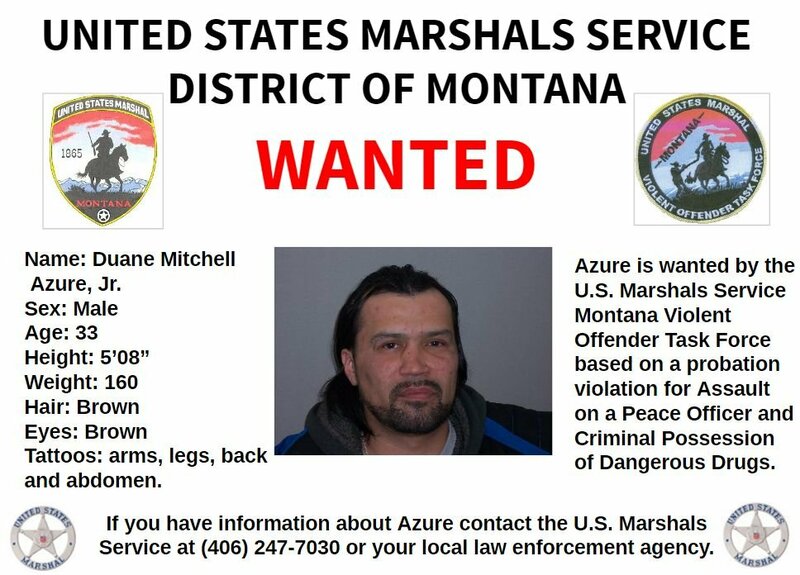 Marshals Service District of Montana has issued a BOLO Alert (Be On the Look-Out) for Duane Mitchell Azure, Jr.
Azure is wanted by the U.S. Marshals Service Montana Violent Offender Task Force based on a probation violation stemming from convictions for assault on a peace officer and criminal possession of dangerous drugs. Both convictions were in Cascade County. Azure is currently classified as an absconder by the Montana Department of Corrections. Anyone with information about Azure is asked to call the U.S. Marshals Service at 406-247-7030, 911, or their local law enforcement agency.